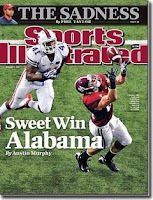 Some excellent writing in the latest Sports Illustrated (cover below) with pieces by Austin Murphy on Alabama football and Lee Jenkins on Vince Young of the Titans. My favorite, though, was on U.S. Bejing Paralympic Athletes Marin Morrison and Nick Scandone. Written by L. Jon Wertheim, it's titled "The Games Of Their Lives" and profiles Morrison and Scandone and their respective battles with terminal illness. For each person, their love of sport and the Paralympic Games appeared to give them a goal which sustained their health. In Morrison's case, she fought cancer and competed as a swimmer and Scandone suffered the effects of Lou Gehrig's disease (ALS) while still sailing at high level. Not a lot to say about the piece other than it's solidly written (Wertheim wrote the book "Strokes of Genius" on the Federer-Nadal tennis rivalry, which I reviewed here) and... well, powerful. This may be a cliche to write, but I would dare someone to read Wertheim's profile of these athletes and not be moved by their stories.